Citizens and property owners may wish to consider how much money they must pay and to whom for government provided essential services, both currently and after Massanutten would be incorporated into a town. This includes taxes and fees to Rockingham County, fees to MPOA, and taxes and fees to a town of Massanutten (if incorporated). A summary of this consideration is included in table below. Please refer to Section VIII of this report for more details. Currently, all county property owners pay real estate and personal property taxes to Rockingham County, including property owners in all towns of Rockingham County. If Massanutten incorporates into a town, all Town of Massanutten property owners would continue to pay county real estate and county personal property taxes which help pay for county provided services, such as schools, courts, and social services. Currently, all county vehicle owners pay a county license tax of $20 per vehicle. If Massanutten incorporates into a town, all town vehicle owners would pay a town vehicle license tax of $20 per vehicle. This town vehicle license tax would be paid in lieu of paying the county vehicle license tax. This means that town vehicle license taxes could be used specifically to fund town services for all town residents, versus the county vehicle license taxes which are deposited into the County’s general fund to pay for county services for all county residents. Currently, all patrons to county businesses pay a county food & beverage tax of 4% and a county transient occupancy tax of 2% to Rockingham County — these are the maximum allowable by VA Law. If Massanutten incorporates into a town, all patrons to town businesses would likely pay a town food & beverage tax of 6% and a town transient occupancy tax of 6% — they could pay up to 10%, pursuant to VA Law. These town taxes would be in lieu of paying the similar county taxes. This means that town food & beverage and town transient occupancy taxes would be used to fund town services for all town residents, versus county taxes which are deposited into the County’s general fund to pay for county services for all county residents. Currently, all property owners in Massanutten Village pay an MPOA assessment fee of $535 per year for each property (lot) to help pay for MPOA provided essential services. If Massanutten incorporates into a town, the amount of MPOA fees and town real estate taxes would depend on what services would be provided by the town. In the table above, three (3) different scenarios are delineated. In the first scenario (alternative T1 in Section VIII of this report), the town would only provide the required town services (RTS) of planning and zoning. MPOA would continue providing road maintenance and law enforcement services in Massanutten Village. In this scenario, MPOA property owners would continue to pay a fixed assessment fee of $535 per year for each property and there would be no ($0) town real estate tax. The required town services of planning and zoning would be paid for by town vehicle license, food & beverage, and transient occupancy tax revenues. In the second scenario (alternative T3 in Section VIII of this report), the town would provide the required town services of planning and zoning, maintenance services for all qualifying town roads, and maintenance services for all town parks. MPOA would continue to provide law enforcement services in Massanutten Village. 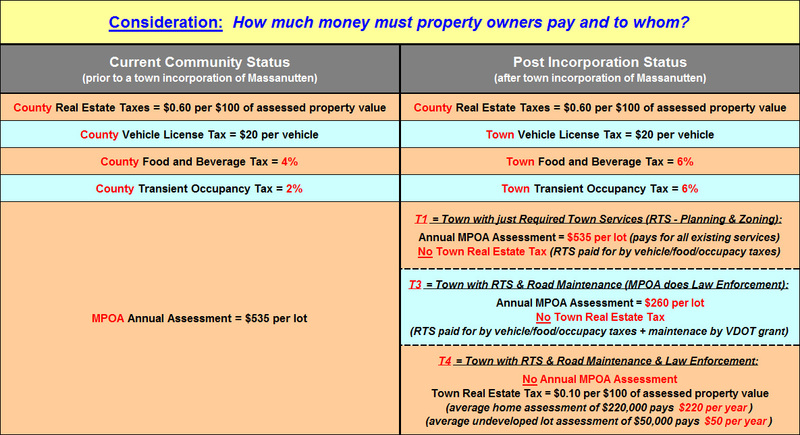 In this scenario, MPOA property owners would only pay assessment fee of $260 per year for each property and there would be no ($0) town real estate tax — there would be a savings of $275 per year for each property (lot) in Massanutten Village. The required town services of planning and zoning would be paid for by town vehicle license, food & beverage, and transient occupancy tax revenues. The maintenance of town roads and town parks is paid for by VDOT grants plus some of the aforementioned town tax revenues. It should be noted that in this scenario VDOT would not provide snow removal of any town roads. This service would be provided by the town and be similar to the service currently provided by MPOA in Massanutten Village. In the third scenario (alternative T4 in Section VIII of this report), the town would provide the required town services of planning and zoning, maintenance services for all qualify town roads, maintenance services for all town parks, and law enforcement services for all town citizens, property owners, businesses, and visitors. MPOA would not provide any essential services for Massanutten Village. In this scenario, MPOA property owners would pay no ($0) annual assessment fee and there would be a progressive town real estate tax of $0.10 per $100 of assessed property value. MPOA administration would be paid for by net revenues from MPOA commercial ventures. The required town services of planning and zoning are paid for by town vehicle license, food & beverage, and transient occupancy tax revenues. The maintenance of town roads and parks is paid for by VDOT grants plus some of the aforementioned town tax revenues. And, the town real estate tax essentially pays for town law enforcement. In Massanutten Village, the average single family home assessed at $220,000 would pay $220 in town real estate taxes — this would be an average savings of $315 per year for each property. In Massanutten Village, the average undeveloped lot assessed at $50,000 would pay $50 in town real estate taxes — this would be an average savings of $485 per year for each lot. Town real estate taxes could be deducted on property owners’ income tax returns, whereas MPOA assessments cannot. It should be noted that VDOT would not provide snow removal of any town roads and the County Sheriff would not be the primary provider of law enforcement in the town. These services would be provided by the town and be similar to the services currently provided by MPOA in Massanutten Village.